As well as offering bespoke remote support we also offer an out of hours ‘responder service’. The out of hours emergency response that we offer to our customers is available from the hours of 9pm – 9am daily. We offer a small pool of responders who are available to respond to a variety of situations. We’re a person centred organisation and we make a point of getting to know you, and the support you want, so you can have confidence in our team when you need to call on us. Our response to a situations is based on a persons support needs. There are many situations that we are able to respond to remotely, however there will always be certain situations in which a physical response is the only option. In these instances we can either send our own responder or if you would prefer contact an allocated person of your own. 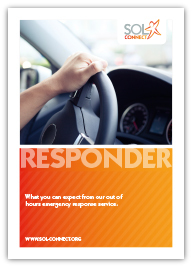 Click here to find out more about our out of hours ‘responder service’. If you would like more information about our out of hours ‘responder service’ please get in touch with us.